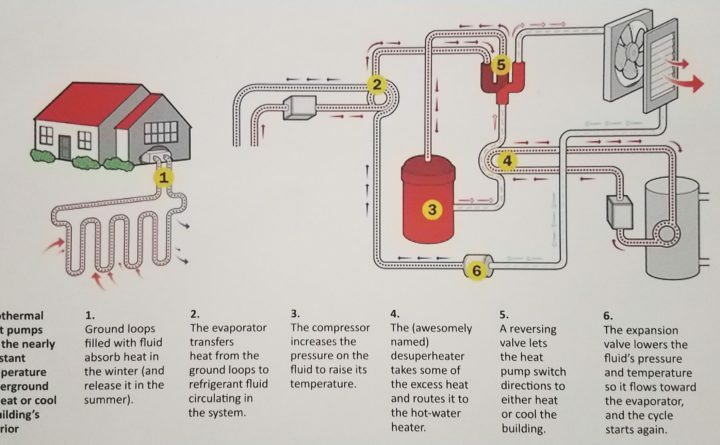 How geothermal heating systems work. When John Nickels was in the United States Navy and stationed aboard a submarine, he read a book about then-President George W. Bush and his use of geothermal technology at his Texas ranch. The retired submariner has been hooked on the subterranean heating and cooling systems ever since. Today, Nickels owns Earth Heat Engineering, based in Hampden, and said he has installed more than 50 geothermal units from Down East to Aroostook County. As a heating and cooling technology, geothermal systems have been around for millenia. According to the U.S. Department of Energy, archaeological evidence indicates the first human use of geothermal resources in North America was 10,000 years ago when Paleo-Indians settled near hot springs. Those springs served as a source of heat in addition to fulfilling health and spiritual needs. Over the centuries more and more people discovered the practical uses of hot springs and in 1892 homes and businesses in Boise, Idaho, became part of the world’s first geothermal district heating system when water from hot springs was piped into the towns’ buildings. Today, geothermal technology is common throughout Europe and gaining steam in the U.S.
“Installing and working with existing [geothermal] systems in Maine keeps me busy every day of the year,” Nickels said. Simply put, Nickels said, geothermal works because the ground beneath us is warmer than the outside air in the winter and cooler in the summer. By installing a series of pipes into the ground, heat can be transferred to and from a building. The underground pipes circulate water or refrigerant into the house through the heat pump which extracts the heat from the liquid and distributes it throughout the home as warm air. The liquid is constantly recirculated through the pipes to collect more of the ground’s warmth. In the summer, Nickels said, that process is reversed with the heat pump collecting hot air from the home and returning it to the earth through liquid in the looped pipes and leaving behind cool air that is also vented throughout the home. Since the heated and cooled air is transported rather than created by a fuel source, it leaves no carbon footprint, beyond what is created by the electrical source powering it, Nickels said. Maine is perfect for geothermal technology, according to Gina Philippon, sales and estimation manager with Midcoast Energy in Damariscotta. Philippon said she has had numerous conversations with people who live in areas of Maine who fear they could not install a geothermal system due to ledge or granite on their property. Operating costs, Nickels said, come into play with the heat pump, which runs off electricity. Even for people tied to the electrical grid, he said heating costs are far lower with geothermal. Nickels said he installs systems that work with new baseboard or ductwork technology or retrofitted into existing residential setups. Nickels works with homeowners to determine the size and configuration of a geothermal system that will best fit the household’s needs. “We do a ‘closed loop’ system that involves drilling bore holes in the ground and the depth and size of those holes will depend on what you need,” he said. As an example, Nickels said for a 2,000-square-foot ranch style home in Maine, he’d likely drill two 400-foot deep holes to install the closed loop system. That network of piping, he said, could be under a lawn, driveway or even the foundation. “You are never going to have to see it again, once we cover it up,” he said. Nickels ballparks the cost of such a system installation at around $42,000, but added existing federal and state tax incentives can bring the out-of-pocket costs down to around $22,000. Before he installed his own geothermal system, Nickels said he was spending between $750 and $800 every two weeks on home heating oil during the winter in addition to burning up to six cords of firewood. Those expenses have been erased thanks to geothermal, he said, adding his house remains at a toasty 73 degrees in the winter and there is plenty of hot water left for his own shower after his wife, two teenage children and one exchange student have all showered. Doing the math, Nickels said, the homeowner was saving money on heat despite paying close to $1,000 a month for the electricity to run the heat pump and disperse the warm air throughout the large home. According to the Maine Governor’s Energy Office, home heating oil in Maine was averaging $2.73 a gallon statewide at the beginning of March, down from $2.95 in January. Based on those figures, 400 gallons of home heating oil would currently cost $1,092. Geothermal system operating costs tend to be more fixed and predictable, as well, Philippon said. In a home heated with fuel oil, Philippon said, the owners are at the mercy of ever fluctuating oil prices. Philippon agrees there is a large, upfront cost, but said it is mitigated by the overall heating or cooling savings over time and the more immediate rebate and tax incentives. For an average 2,000-square-foot home, Philippon said converting to a standard geothermal duct system capable of producing between 40,000 and 60,000 BTUs carries a total cost of $45,000. Despite the obvious heating costs savings, people may be discouraged from pursuing the earth-based alternative heating source due in large part to the five-figure installation costs. That expense, Smith said, is the main reason her office does not field a lot of calls on geothermal heating. Those who do opt to install the systems, she said, often do so for reasons beyond simple economics. And Smith did say, there is no denying geothermal is a clean source of energy, albeit one with what she said is a long payback on investment. There is no doubt it’s a hefty out of pocket initial expense, Nickels said, but he maintains that payback and the good it does for the environment make it well worth it. As for the argument it’s too expensive? Nickels does not buy it.